Excerpts from a new E*TRADE Advisor Services study. Visit here. Advisors are bullish on the market. 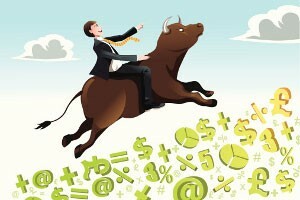 Nearly three quarters of advisors (72%) are bullish on the market over the next quarter. But volatility is a major client concern. Nearly half of advisors (47%) said their clients are contacting them to express concern about market volatility. Clients are eyeing alternatives, but aren’t turning to crypto. Amid global slowdown concerns, investors may be looking beyond traditional investments. Real estate (30%) and cannabis securities (18%) are top ranked according to advisors, while only 3% said their clients are interested in cryptocurrencies. RIAs see opportunity in beaten-down sectors. More than half of advisors (51%) said the information technology sector could offer buying opportunities this quarter, followed by financials (34%) and health care (34%). Investors continue to want to act on their emotions. Advisors noted the biggest mistake clients make is trying to time the markets (43%) followed by not saving enough for retirement (27%). The results also revealed advisors have yet to truly focus on specialty client segments. Almost half of RIAs surveyed said they specialize in Baby Boomer investors (44%), while over a quarter indicated they do not specialize in any particular client segment. When it comes to the market in the next three months, are you? When it comes to the market, what are your clients contacting you most about? What is the biggest mistake you see your clients making? Thinking of your individual book of business, do you specialize in any of the following client segments? This survey was conducted in-house from March 19 to March 26, 2019, among a convenience sample of 302 independent RIAs. E*TRADE Financial and its subsidiaries provide financial services including brokerage and banking products and services to retail customers. Securities products and services are offered by E*TRADE Securities LLC (Member FINRA/SIPC). Commodity futures and options on futures products and services are offered by E*TRADE Futures LLC (Member NFA). Managed Account Solutions are offered through E*TRADE Capital Management, LLC, a Registered Investment Adviser. Bank products and services are offered by E*TRADE Bank, and RIA custody solutions are offered by E*TRADE Savings Bank doing business as “E*TRADE Advisor Services,” both of which are national federal savings banks (Members FDIC). More information is available at www.etrade.com.